I have to start this review by saying this is one of the best books I have read in a while, and it was one of those books that I was quite disappointed when I had finished it because I was enjoying it so much! 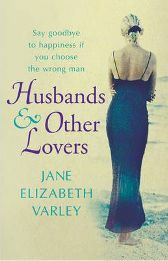 ‘Husbands and Other Lovers‘ is the second book written by Jane Elizabeth Varley. Her first book had a similar title – ‘Wives and Lovers’ – and in both of these books she deals very well, in my opinion, with the complexities of modern day relationships. Some might think of this type of book as ‘chick lit’ but I think it’s more substantial than that, although I would definitely say that it is a book for women. In ‘Husbands and Other Lovers’, we meet two brothers – James and Robert Agnew – and the women in their lives! James is married to Susannah, and although on the surface they might appear to have a very successful marriage, things are not what they seem. The main problem for them is that James is an alcoholic, and this is what drives a wedge into the heart of their marriage especially as Susannah cannot understand why someone as successful as James cannot control his drinking. There comes a time in the book, when things get so bad that James has to book himself into a clinic and he actually admits that he is an alcoholic. The full range of emotions that they both go through at this stage are very sensitively portrayed – bewilderment, frustration, anger, loss – everything is there and it’s very raw as they struggle to come to terms with the implications James’ alcoholism has on both their lives. Robert, the other brother, is a very dislikeable character. He is a very successful business man, but in his relationships, his main aim seems to be to control and manipulate – which he manages to do very successfully for most of the book. There are three main women in his life: Tabitha, his ex-wife, with whom he has an ongoing custody battle over their daughter; Jasmine, his ex-girlfriend, who he is set on ruining in every sense; and Natasha, his new girlfriend and soon to be wife, who fails to see how she is being used. As the story unfolds, we see the very worst of Robert, who is not a very sympathetic character in the least. As in a lot of women’s novels, it tends to be the women who are the stronger characters. All four of the main women are well developed and you do emphasise with their predicaments. Tabitha has a new love interest in America and has to find the strength to fight Robert to allow her to take their daughter out of the country. Jasmine finds the strength to rebuild her life after being so emotionally battered and bruised by Robert. Natasha finds the strength to stand up for what she knows is right, even when it means going against her new husband. These three women do not actually meet each other until the end of the story, but when they do they discover there is also strength in numbers. Susannah’s story tends to run independently of the others, but she also has to find strength in deciding what is the best course of action in order for both her and James to be able to move forward. I think all these different stories are crafted together and interspersed extremely well. As I was reading this book, I just wanted to read on and on to find out what would happen next. I liked the female characters and felt that the storyline was intriguing. I have not given away what happens, but I hope I have said just enough to provoke your interest. I think there are also quite a number of issues which are dealt with well in this book. I have already mentioned alcoholism, but there is also the subject of bullying, and the effect this has on the women being bullied. At times, although it is only a story, it is quite uncomfortable reading, as you realise that there are men like Robert in real life too. There is also the issue of divorce, and the pain of any custody battle. Robert also uses his daughter a bit like a pawn, pumping her for information about her mother’s boyfriend, and trying to put ideas into her head! Not very nice at all! So overall, I would thoroughly recommend ‘Husbands and Other Lovers’, and also Jane Elizabeth Varley as a writer. No Comments on "Husbands and Other Lovers"